David W. (D.W.) Friesen: businessman and church worker, was born 12 June 1879 in Schoensee, Manitoba, a village in the East Reserve, to David Friesen (1856-1893) and Anna Wiens (1857-1883). On 23 July 1901, he married Maria Kroeker (1882-1907). 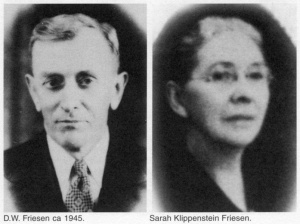 Following the death of his first wife, he married Sarah Klippenstein Striemer, a widow with three children, in 1907. Together, D.W. and Sarah had five sons and two daughters: Margaret Friesen (1908-1926), David K. Friese (1910-1991), John K. Friesen (1912-2010 ), Anne (Friesen) Loewen (1914-2006), Theodore (Ted) E. Friesen (1920-2016) and Raymond C. Friesen (1922-1990). D.W. Friesen died of cancer on 19 May 1951. D.W. Friesen moved to Lichtfeld, west of Altona MB, in the mid-1890s with his step-parents, Anna Klassen and Cornelius Bergman. He attended school until the age of fourteen. He farmed west of Altona from 1901 to 1903, then taught in the Mennonite West Reserve village of Gnadenfeld for two years. In 1905 he moved to Altona and started an implement dealership, but soon left this business. 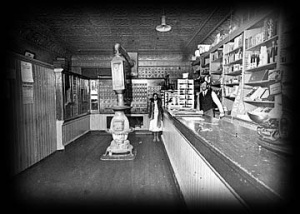 He bought a confectionery store and was made postmaster in Altona in 1907. From 1910 to 1946, he was also an agent for Manitoba Government Telephones. Retail book sales were added in 1923, and a print shop and wholesale stationery supply in 1930. This business expanded to become one of Canada’s largest printing companies, D.W. Friesen & Sons. D.W. sold the company in 1948 to three of his sons, David, Ted and Ray, and quit as postmaster in 1949. D.W. Friesen & Sons began publishing a weekly newspaper, the Red River Valley Echo, in 1941. The first English-language Mennonite newspaper in Canada, The Canadian Mennonite, was also a Friesen publication. Other significant Mennonite publications were In Search of Utopia by E.K. Francis and, together with the Mennonite Historical Society, Paul J. Schaefer’s four volume series Woher? Wohin? Mennoniten! The company was renamed Friesens Corporation in 1995. Now employee-held rather than family-owned, Friesens Corporation has more than 600 employees. Besides his many business responsibilities, D.W. was active in the church. He was baptized into the Rudnerweide Sommerfeld Mennonite Church on 5 June 1900. He joined the Altona Bergthaler Mennonite Church in 1907, was elected a deacon in 1912 and ordained as such in 1914. He served in this capacity until 1949. As deacon, he was one of two administrators of the Armenkasse (treasury for the poor) and also managed the Wohltaetigkeitskomitee (welfare committee). The Armenkasse consisted of levies on property and donations of money, grain, clothing and food. The Bergthaler Armenkasse was administered by deacons until the 1950s, and then taken over by church and conference service committees. It differed from the Waisenamt (see entry for mutual aid) in that the latter administered the inheritances of orphans, cared for widows, and served as a banking institution. The Bergthaler Wohltaetigskeitkomittee was formed in 1926 or 1927 to oversee all church relief work. The nine members of this committee were laymen, and Bergthaler historian Henry Gerbrandt claims no records exist of its activities, though "[t]hese were immigration and Russian relief days. Much work was to be done." The Wohltaetigskeitkomittee was in a sense replaced by the Fuersorgekomittee (board of business administration), responsible for financial and business matters, including preparation of budgets and building of new churches. Both the Wohltaetigskeitkomittee and Fuersorgekomittee were at odds from time to time with the Lehrdienst. Epp, Frank H. “D.W. Friesen and His Life Work.” Mennonite Life 11 (July 1956): 118-9. Friesen, Ted, comp. “D.W. Friesen, 1879-1951, Altona-Community Builder.” Preservings: Journal of the Hanover-Steinbach Historical Society 20 (June 2002): 89-97. McGuinness, Fred. Friesens: A Unique Company. Altona MB: Friesens Corporation, 2001. Peters, Jake. The Waisenamt: A History of Mennonite Inheritance Custom. Mennonite Village Museum Historical Series 1. Steinbach MB: Mennonite Village Museum, 1985. The personal papers of David W. Friesen are held at the archives of the Mennonite Heritage Centre, Winnipeg MB. The estate papers of D.W. Friesen and some records relating to Friesens Corporation are held at the Altona and District Research Centre, Altona MB. Thiessen, Janis. "Friesen, David W. (1879-1951)." Global Anabaptist Mennonite Encyclopedia Online. June 2004. Web. 20 Apr 2019. http://gameo.org/index.php?title=Friesen,_David_W._(1879-1951)&oldid=148929. Thiessen, Janis. (June 2004). Friesen, David W. (1879-1951). Global Anabaptist Mennonite Encyclopedia Online. Retrieved 20 April 2019, from http://gameo.org/index.php?title=Friesen,_David_W._(1879-1951)&oldid=148929. This page was last modified on 20 June 2017, at 00:59.